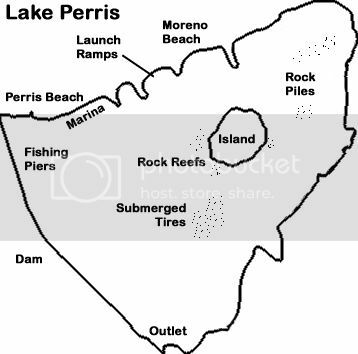 Lake Perris is a large body of water located in Riverside County and is a popular location for largemouth bass anglers. For years this lake has been known as a trophy largemouth lake, but the numbers of large fish have been on the decline recently and a greater number of smaller fish are being caught. This may be due to the large percentage of catch and release anglers at this lake. Lake Perris also supports a healthy carp population with many large fish. With miles of available shoreline for anglers, Lake Perris is a great spot to go out for some carping. One negative thing about Lake Perris is the amount of boat and jet ski traffic in the warmer months. During these times you definately want to get out early or even at night to avoid the crowds. Night fishing is allowed but you must purchase a campsite to be in the park. Location: 17801 Lake Perris Drive. Highway 60 to Moreno Beach Drive, then south to park; or Interstate 215 to Ramona Expressway, east to Lake Perris Drive, then north to park. Hours: Summer, 6 a.m. to 10 p.m.; winter, 6 a.m. to 8 p.m. Features: Camping, boating, swimming, fishing, bike trail, hiking trails, equestrian trails and regional Indian museum. Campground facilities: 167 developed tent sites, 264 RV sites with hookups, 6 group picnic areas. Horsecamps.